My mom used to call pizza the “King of Junkfood.” What she meant was pizza feels like junk food, it can actually be healthy, with bread and vegetables and cheese. I truly think your average pizza is decidedly not healthy, but that’s not a problem. Everyone needs some cheese and carbs every once in awhile. This pizza might deserve the “King of Junkfood” title more than any other pizza around, though. I found some whole wheat pizza dough in my freezer (aka the black hole) and recognized that I had a pound of brussels sprouts ready to be used. 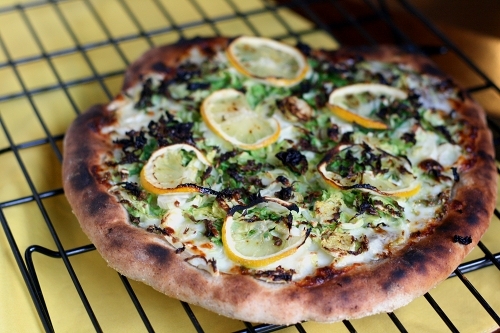 Most pizza recipes with brussels sprouts also contain bacon, obviously because the two are a winning combination. I ran across a vegetarian rendition of the pizza, and keeping with the healthy theme of the whole wheat dough, decided to try it out. 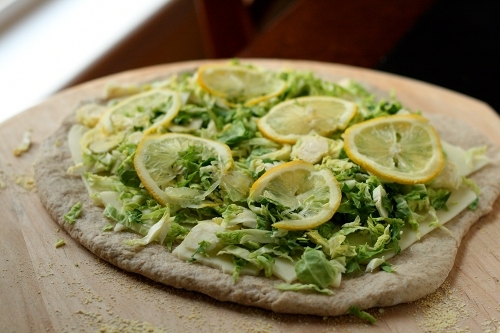 Are you scared of lemon on pizza? Don’t be. What a delicious surprise! The cooking mellows the flavor, but they retain their juicy bite and go perfectly with the cheese and veggies. Be sure to slice them thinly so they just sort of dissolve into your pizza. Who loved this pizza the most? The Omnivore. However, that doesn’t mean we won’t be fighting over the lone leftover piece. By the way, the recipe is a Martha Steward recipe, so of course the Omnivore couldn’t resist cracking jokes about learning amazing recipes in jail throughout our dinner. You can read about my new favorite pizza cooking technique here. This page also includes a wonderful pizza dough recipe. Preheat oven and pizza stone to 550 degrees. Work dough into a round pie (if it retracts, let rest 5 minutes before continuing). Place dough round on a pizza peel or the back of a cookie sheet dusted with cornmeal. Brush a 1-inch border around edge with 1 teaspoon oil. Scatter mozzarella and half the Pecorino evenly over dough, leaving a 1/2-inch border around edge. Toss brussels sprouts with remaining Pecorino, 1/4 teaspoon salt, and 1/4 teaspoon pepper. Scatter sprout mixture over cheeses, and top with lemon. Turn over to broil (high if you have the option) and slide pizza onto prepared pizza stone. Cook 5-7 minutes until crust is browned, cheese is melted, and toppings are cooked. Transfer pizza to a cooling rack so that crust does not get soggy. This entry was posted in Brady Evans Venables, Cooking, Food, Recipes and tagged Brady Evans Venables, Columbia, columbia sc, cooking, every woman blog, Famously Hot, food, hospital blog, Lexington, lexington medical center., lexington sc, Lexington Women, lmc, LMC every woman blogger, Midlands, Midlands Women, South Carolina, South Carolina Women, Women, women's blog, women's hospital blog by Kate Gillmer. Bookmark the permalink.